Maharashtra State Board of Technical Education invites scholarship applications for the year 2018-19. 1. The applicant should be a fresh student admitted for the first time to the First Year/Sem of any AICTE approved Diploma course in Engineering and Technology at an MSBTE affiliated Institute in Maharashtra during 2018-19 (For Fresh Candidates). 2. The applicant should have scored at least 70% marks at the entry qualification (SSC for all Engineering & Technology courses and HSC for Pharmacy course). The total percentage of marks scored at the qualifying examination shall be considered for 15 year admitted students. 4. Income limit for becoming eligible for scholarship shall be maximum 5 Lakh per annum. 5. 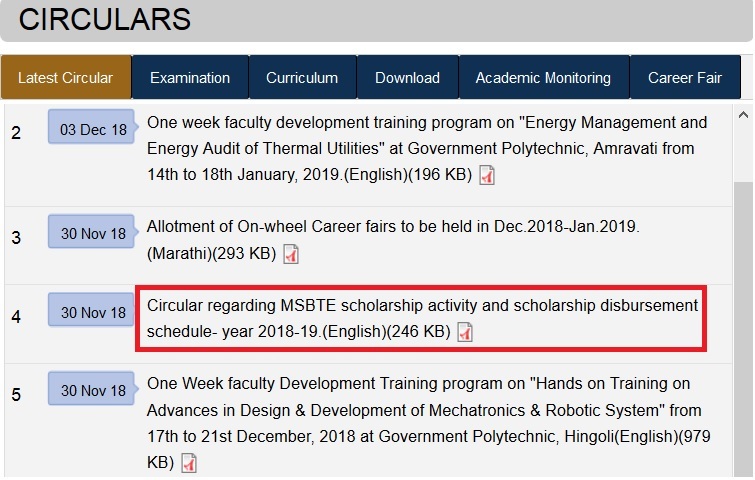 Candidates admitted to Autonomous Polytechnics within Maharashtra and whose equivalence is confirmed by MSBTE, Mumbai are also eligible to apply. The total Number of Scholarships shall be calculated every year based on intake capacity of MSBTE affiliated courses for that particular year. Scholarships per course shall be proportionate to 6 Number per 1000 intake. However, the number of scholarships as per State Merit List shall be limited to 952 only for each year. (1$, 2nd, 310) or academic year. iii. Statement of Mark of first year/second year diploma course (whichever applicable). iv. Photo copy of first page of pass book of saving account of a Nationalized Bank showing clearly Name of Account holder, Account Number, IFSC Code of branch etc. Care should be taken in mentioning correct account number and IFSC Code. ** The concerned institute should verify every detail of the application confirmed by student. After confirming the correctness of information, institute has to confirm the application, secure print of the reports of all the eligible students and submit the same duly signed by Principal with institute seal along with necessary declaration to respective RBTE. ** RBTE will verify the document by constituting a three member committee headed by the Principal of a polytechnic and assisted by person not below the rank of lecturer and confirm the same online. ** SBTE will sort out the data of eligible candidates and display the provisional list of candidates to whom scholarship shall be awarded on its website. ** Candidate can apply whilst studying in Second year and Third Year subject to satisfying the eligibility criteria as that of first year. Scholarship shall be awarded as per discipline wise merit among the applicants, passing first year and second year diploma examination result respectively against the discipline wise vacancies.